A big pat on the back to the District for being proactive and getting the water fountains at all schools tested. Unfortunately 25 units were found to contain lead, which is not surprising considering the age of our schools. Old school. Old pipes. 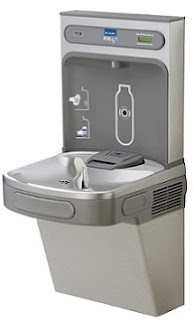 I was happy to hear from a current board member that the district will be installing filtered water bottle stations. I've seen these at other schools and love them! After all does anyone really put their lips to the water fountain anymore. No! Fill up those Poland Spring bottles. Love it! Great job Paramus. Here's a pic of the new water fountains in case you don't know what i'm talking about.